Our harvester blades come in a variety of different styles and sizes to suit a variety of different harvest situations. Scallop and wavy band blades are the standard of the baby greens and spinach industry. An extremely sharp edge makes them the perfect choice for a surgical cut. Available in band blade and reciprocating blade styles. Our band blades are compatible with Ortomec harvesters. Made of hard edge, heat-treated high carbon steel. They're packaged individually for safe handling. 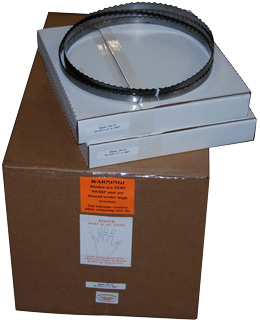 Each blade is compacted and bound with a wire tie, then packed into a box for safe handling and storage. Blades are available in singles, or in 10-packs for volume pricing (10% discount on purchase of 10+ blades). Ortomec's Herbex head is used when harvesting head lettuces and for crops that are cut underground like mache and spinach. For head lettuces, Herbex with a reciprocating blade is used. For underground cutting, Herbex with the very aggressive "toothed" blade is used. 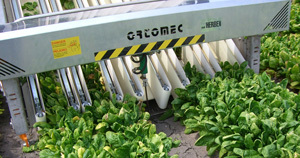 A reciprocating blade is used when harvesting head lettuces with Ortomec's Herbex head. A special "toothed" blade is used when harvesting underground crops with Ortomec's Herbex head.